Publisher: The Doubleday Religious Publishing Group, Westminster, MD, U.S.A.
Lucas, a musician and translator living in Barcelona’s Gothic Quarter, comes home one day to find a cryptic invitation to a local art gallery slipped under his door. When he appears at the appointed time, he sets in motion a series of improbable, seemingly interconnected events that disrupt his previously passive existence. He meets the alluring Nuria and they begin an intense love affair. He is approached by a band of Barcelona’s mythic roof dwellers and has a run-in with a fire-eating prophet. But when he and Nuria are kidnapped by a religious cult with roots stretching back to the thirteenth century, Lucas realizes that his life is spinning out of control. The cult’s megalomaniac leader, Ponteuf, maintains that Nuria and Lucas are essential to his plan to revive the religion. While Nuria is surprisingly open to Ponteuf and his theories, Lucas is outraged and makes his escape. Back in Barcelona, Lucas wanders the streets in a drug-and-alcohol-induced haze, pining for Nuria and struggling to make sense of what happened to him. He recounts his improbable adventures to his friends, who are wholly entertained by the story and deeply doubtful of its truth, a skepticism that is exacerbated by Lucas’s tendency to use the third person and flaunt different narrative styles. 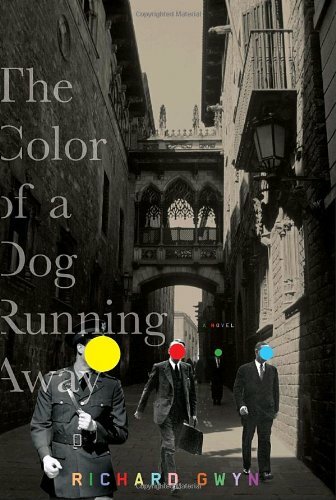 A love story, tale of adventure, historical thriller, and evocative tour of Barcelona, THE COLOR OF A DOG RUNNING AWAY is a dazzling blend of the surreal and the ordinary, a novel that beguiles and disturbs in equal measure. Richard Gwyn was born in Wales. A poet and translator, this is his first novel. His Web site can be found at www.richardgwyn.com.